This is a smudge-proof and waterproof kajal, which is dermatologically tested, with a deep black stroke in an easy twist-up format, it gives your eyes a long-lasting, eyeconic look throughout the day This kajal lasts for up to 10 hrs, it is dermatologically tested and is safe for the eyes This kajal lasts up to 10 hrs, it is dermatologically tested and is safe for the eyes Accentuate the beauty of your eyes with the Lakmé Eyeconic Kajal. This dermatologically tested kajal is just what you need for completing your eye makeup or carrying a simple, only-kajal look. It's a smudge proof, water proof kajal and can add the dramatic and glamorous look to your eyes. It long-lasting- up to 10 hours and is designed with an easy to use and convenient twist-up format. Just one stroke of the Lakmé Eyeconic Kajal enhances your simple look to a more stylish avatar. You are incomplete without kajal and this is a perfect everyday product. 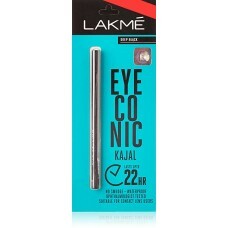 Get the Lakmé Eyeconic Kajal right now.